If I've learned anything from watching Jingle Ma's 'The Assassin's Blade,' it’s that the real key to any woman's heart, is to take her on a piggyback ride through Butterfly Valley. And no, I assure you, that isn't some kind of sexual euphemism. At least… not yet. A sappy and goofy Hong Kong wuxia flick, the movie is home to several ridiculous excursions into melodramatic romance, light-hearted buffoonery, and clunky tragedy. Uneven and occasionally pedestrian, the movie is far from a success, but it isn't without its momentary charms and thrills. Inspired by the Chinese legend of "The Butterfly Lovers," the story follows a young woman, Zhu Yanzhi (Charlene Choi), who pretends to be a man in order to attend a martial arts training school. While she attempts to learn how to fight, she quickly falls in love with one of her teachers, Liang (Chun Wu). When Liang discovers the truth about Zhu's gender, he too starts to develop feelings, but another jealous suitor (Ge Hu) threatens to destroy their romance and their lives. After an incredibly abrupt and clunky introduction, the film thrusts us right into Zhu's story with very little set up. She simply wakes up and then all of the sudden it's time to dress up like a boy and head off into the mountains. These early scenes are filled with overtly goofy gags and random silliness, mixing sporadic wuxia action with lighthearted absurdity as Zhu tries to integrate into the martial arts clan. A lot of this comedy can be pretty dumb and the dialogue -- or at least the English translation of the dialogue -- is borderline nonsensical. Of course, the most ridiculous aspect of the plot involves Zhu's male "disguise." To put it simply, she isn't fooling anybody. Seriously, she's clearly a woman. A woman wearing makeup. Still, all the men seem to be completely oblivious to this fact, leading to some predictable sequences where her gender is almost revealed -- including an obligatory nervous bath time scene. I suppose that's all just part of the intended silliness, though, and despite frequent lapses in logic, the cast (especially Charlene Choi) creates an oddly endearing atmosphere. While the acting starts off very foolish and unnatural, there is a certain charm to the characters -- even if their behavior and mannerisms are utterly bizarre. The comedy is also bolstered by a generous helping of corny romance that follows Zhu and Liang as they bond together like bothers. Well, like brothers who are falling in love. Though cute, their coupling is pretty cheesy and melodramatic. An excursion to the aforementioned Butterfly Valley and a slow motion shot of the young woman riding piggyback on Liang while a sappy Chinese love song plays on in the background, are perhaps the apex of this schmaltziness. Thankfully, beyond these histrionics, their connection with one another is solid, helping to drive much of the drama that fuels the film's unexpectedly solemn and bloody finale. As blithe and comedic as the movie's first half is, the second half takes a complete 180. The entire tone changes dramatically, and we find our once happy-go-lucky characters facing dangerous obstacles. The action ramps up considerably in these later portions as well, and the subsequent fight scenes feature kinetic and exciting choreography with a few cool stylistic flourishes. The climax, set in the rain and bathed in moody red lights, is particularly striking. The acting also becomes much more serious and considering their otherwise buffoonish personas earlier on, the cast handles this switch surprisingly well. Again, Charlene Choi is especially noteworthy, and does a nice job of eliciting some genuine emotion from her increasingly dire predicament. Unfortunately, while both halves work somewhat as individual parts (the second more so than the fist), the tonal shift is still very jarring. The tragic, bittersweet conclusion ends up feeling at odds with what came before, and the movie as a whole just doesn't come together cohesively. As a goofy romance flick it's pretty dumb, and as an action drama it's very uneven and clunky. With that said, Charlene Choi is a charismatic lead (even when she is acting like a cartoonish clown) and some of the later action sequences are genuinely thrilling and visually interesting. 'The Assassin's Blade' (which now joins an increasingly long list of movie titles that have absolutely nothing to do with anything) isn't anywhere near the same caliber as other, superior wuxia films like 'Hero' or 'Crouching Tiger, Hidden Dragon,' but its odd, sometimes pedestrian qualities are elevated by some occasional charm and vigor. 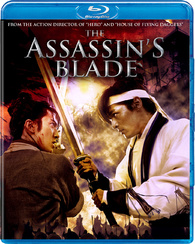 Well Go USA brings 'The Assassin's Blade' to Blu-ray on a BD-25 disc housed in a keepcase. Some skippable trailers play upon start up before transitioning to a standard menu. The packaging indicates that the release is region A coded. The movie is provided with a 1080p/AVC MPEG-4 transfer in the 2.35:1 aspect ratio. Intentionally stylized in a dreamy haze, the movie's chosen aesthetic has some drawbacks, and there are some apparent technical issues as well. The print is in great condition with no signs of damage. A light layer of grain is visible but the heavy filtering and color correction robs the image of a natural, filmic appearance. Likewise, the grain structure looks a little digitized in some instances, and while the movie was apparently shot on film (according to IMDB) the climactic fight scene has a very digital look. Detail is decent, but the dreamy visual style makes for a comparatively soft appearance. Going along with this, colors are washed in subdued, pastel hues and there is a faintly lavender cast to much of the film. With that said, there are some vibrant splashes of saturation (particularly with lush greens) that offer some sporadic pop. Whites are blown out, further reinforcing the hazy, shimmering quality of the cinematography, and blacks are noticeably faded and washed out, resulting in a very flat appearance. 'The Assassin's Blade' has a very distinct visual style, but the chosen aesthetic robs much of the film of depth and clarity, and the transfer looks a bit processed and faded. The film is presented with a Cantonese DTS-HD Master Audio 5.1 track and Dolby Digital 2.0 track, along with optional English subtitles. Uneven and forced, the mix features a very limited scope that feels a bit unnatural. Dialogue is clear and clean, but the actor's speech appears to have been added in post, leading to sync issues that cause a slight disconnect between their words and their performances. The soundstage is relatively anemic throughout most of the runtime, with a very restrained sense of ambiance that is often limited to a single background effect (crackling fire, falling rain) rather than layers of sound, making the auditory environment feel unnatural. Likewise, while surround activity does perk up during the various fight sequences, the effects work and imaging are rather gimmicky, causing the swooshing punches and sword slashes to sound forced and unrefined. Though not particularly engaging, low frequencies are solid and dynamic range is relatively wide and free from distortion. The track provides a few splashes of adequate immersion, but the mix lacks real texture, scope, and sophistication. Trailer (SD, 1 min) - The film's trailer is included with Dolby Digital 2.0 audio. 'The Assassin's Blade' starts off as a silly, sappy wuxia flick and then becomes a tragic, sappy wuxia flick. Neither aspect really fits together or works completely on its own, but the cast has some appeal and the action scenes are solid. The video features an intentionally stylized image and while the results are often underwhelming they seem to be mostly in line with the filmmakers' intentions. The audio is limited and forced, but it gets the job done with some occasional kick. Unfortunately, there are no special features outside of a trailer. Fans of other wuxia efforts might want to give this a rent, but most will likely be better off just skipping it.